In a large skillet, heat the olive oil and add the ham. Sauté for several minutes, until the ham has begun to turn golden brown. Then stir-in the rice and beans. Mix the ingredients well–the rice will turn a bit brown with the broth from the beans. Last, add the sweet peppers and the cilantro to the mixture. Continue cooking over medium heat for 5-10 minutes. Serve hot alongside your favorite side dish. The habichuelas or red kidney beans can be substituted for garbanzo or black beans. To give a special toque to this dish, use Spanish chorizo instead of ham. Try adding some pieces of chopped ripe plantain for a little sweetness. 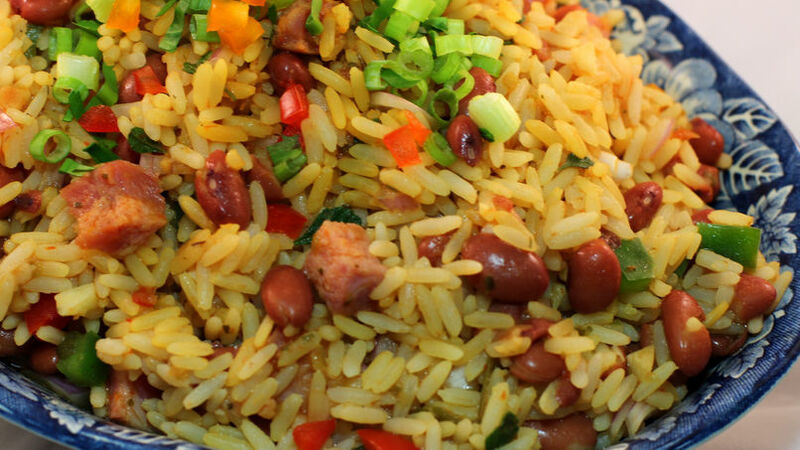 When I tried this rice for the first time, I was delighted with the sabor from the combination of the white rice and the stewed habichuelas (red kidney beans.) Very easy to prepare, I like to call this dish my 'last-minute meal saver.' Most of the time we already have some white rice and habichuelas left over in the fridge. All that's left to do is give these ingredients a different toque with diced ham and bell peppers–your family will never realize they're eating leftovers. Try it out and let me know how it works for you!